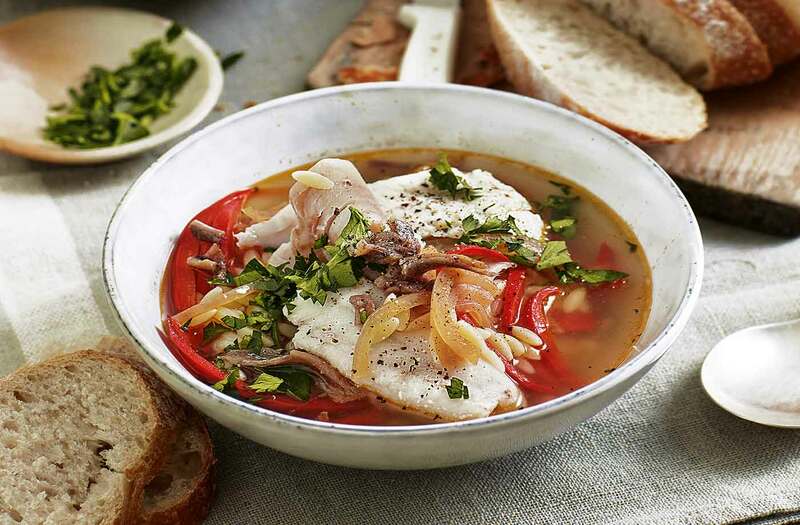 This Sicilian-inspired hake broth filled with red peppers and orzo is a delicious twist on a fish soup, perfect for warmer spring nights. Tender hake fillets poach in the fragrant broth to absorb all the flavours – serve with plenty of crusty bread to mop up all the juices. Heat the oil in a large, lidded saucepan or deep frying pan and fry the onions and peppers over a medium heat, stirring, for 5 mins. Add the garlic and rosemary; season. Reduce the heat to low, cover and cook for 40 mins, stirring occasionally, until the onions and peppers are very soft. Discard the rosemary. Meanwhile, bring a saucepan of water to the boil and cook the orzo for 5 mins. Drain well and set aside. Rinse the hake fillets, pat dry with kitchen paper and cut each in half. Stir the orzo into the pepper mixture. Add the stock and wine and bring to the boil. Reduce the heat to a gentle simmer, add the fish, cover and poach gently for 5 mins. Turn off the heat and let it stand for 5 mins. To serve, carefully remove the fish using a slotted spoon; set aside. Divide the broth between warm serving bowls, then top with the fish. Sprinkle with the chopped anchovies, if using, and parsley. Serve immediately with crusty bread.